The first edition of the programme was launched in 2015 by l’Atelier de l’Observatoire (Art and Research) in Casablanca. The second edition of the programme will accept eight participants and is comprised of two components. The first is a training session in Casablanca (25 - 29 September 2017). It will include meetings, site visits, presentations and case studies led by regional and international curators and speakers. The second component is a ten-day curatorial residency in one of Madrassa’s partner institutions in Algeria, Egypt, Jordan or Morocco (see below). 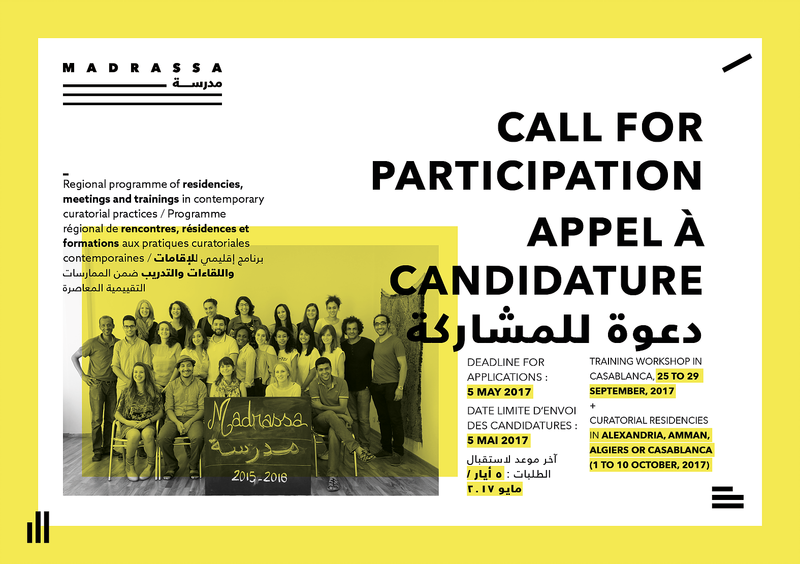 The training and residencies are specifically dedicated to alternative historiographical approaches that are being developed in North Africa and the Middle East through curatorial practices. In the specific context of the region, we will think and reflect about the essential role of contemporary exhibitions and curatorial essays and projects, in the important writing of narratives and histories of art and culture. ∙ Experience in a structure such as a museum, an arts center, a gallery, a festival, a biennale, an artists’ residency, an arts or culture magazine, archives, etc. ∙ Able to participate in training sessions which will be given - or translated - in English, as it is the common language of most participants and speakers.